Truck drivers operate heavy trucks to transport goods and materials over urban, interurban, provincial and international routes. They are employed by transportation companies, manufacturing and distribution companies, moving companies and employment service agencies, or they may be self‑employed. ‑ May transport hazardous products or dangerous goods. ‑ Perform pre‑trip inspection and oversee all aspects of vehicles such as condition of equipment, and loading and unloading of cargo. ‑ Completion of secondary school is usually required. ‑ On‑the‑job training is provided. ‑ A Class‑D licence is required to drive straight trucks. ‑ A Class‑A licence is required to drive articulated trucks. ‑ Air brake endorsement (Z) is required for drivers who operate vehicles equipped with air brakes. ‑ Transportation of dangerous goods (TDG) certification is required for drivers who transport hazardous products or dangerous goods. ‑ Progression to supervisory positions or to non‑driving occupations, such as driver trainers, safety officers or truck dispatchers is possible with additional training or experience. * May transport hazardous products or dangerous goods. * Perform pre‑trip inspection and oversee all aspects of vehicles such as condition of equipment, and loading and unloading of cargo. * On‑the‑job training is provided. * A Class 3 or D licence is required to drive straight trucks. * A Class 1 or A licence is required to drive articulated trucks. * Air brake endorsement (Z) is required for drivers who operate vehicles equipped with air brakes. * Transportation of dangerous goods (TDG) certification is required for drivers who transport hazardous products or dangerous goods. * Progression to supervisory positions or to non‑driving occupations, such as driver trainers, safety officers or truck dispatchers is possible with additional training or experience. Truck drivers operate heavy trucks to transport goods and materials over urban, interurban, provincial and international routes. They are employed by transportation companies, manufacturing and distribution companies, moving companies or they may be self‑employed. To scan for specific information/To locate information To skim for overall meaning, to get the 'gist'. To read the full text to understand or to learn. To read the full text to critique or to evaluate. The symbols >, >>, and >>> are explained in the Notes section. Read signs, labels or lists. Complete forms by marking check boxes, recording numerical information or entering words, phrases, sentences or texts of a paragraph or more. Read completed forms containing check boxes, numerical entries, phrases, addresses, sentences or texts of a paragraph or more. Read tables, schedules or other table‑like text. Enter information in tables, schedules or other table‑like texts. Obtain specific information from graphs or charts. Recognize common angles such as 15, 30, 45 and 90 degrees. Obtain information from sketches, pictures or icons. read and write, count, round off, add or subtract, multiply or divide whole numbers. For example, recording how many litres of fuel are in each compartment and adding to get the total; calculating change for a delivery payment. read and write, add or subtract integers. For example, using negative numbers to denote a shortage of freight at the destination. read and write, add or subtract fractions. For example, recording fractions of an hour in the log book. read and write, round off, add or subtract decimals, multiply or divide decimals. For example, adding the cost of repairs in dollars and cents. read and write percents, calculate the percent one number is of another, calculate a percent of a number. For example, calculating the actual weight of a load as a percentage of the total allowable load for the vehicle. convert between fractions and decimals or percentages. For example, converting 3/4 hr to .75 hr to multiply by their hourly rate. solve problems by constructing and solving equations with one unknown, use formulae by inserting quantities for variables and solving. For example, using a formula to calculate cubic weight. use a rate showing comparison between two quantities with different units, use a ratio showing comparison between two quantities with the same units, use a proportion showing comparison between two ratios or rates in order to solve problems. For example, calculating the amount of fuel additive to use for a certain amount of fuel in order to obtain a particular fuel to additive ratio, such as 4 to 1.
perform measurement conversions. For example, converting kilograms to pounds and litres to gallons when driving in the United States. calculate volumes. For example, calculating the volume of diesel when carrying tanker loads; or calculating the space taken up by a load in order to maintain a 95% full rate. Using a pen and paper. Time. For example, using a clock or watch. Weight or mass. For example, using a weigh scale or truck scale. Distance or dimension. For example, using an odometer or measuring tape. Liquid volume. For example, using a graduated cylinder or fuel gauge. Temperature. For example, using a thermometer or truck temperature gauges. Pressure. For example, using oil pressure and air brakes gauges. Specific gravity. For example, using a hydrometer. Using the metric measurement system. Using a two‑way radio or other such means. The sound of the truck engine can impede communication when travelling with a partner. Communication on loading docks may be hindered by noise from heavy equipment such as forklifts or cranes. Truck drivers' planning tends to be short term. While customers and locations may vary, work follows a repetitive pattern of loading, driving and unloading. The schedule is prepared by a dispatcher or supervisor and the drivers have little input into scheduling. While truck drivers have little control over their schedule, they have some flexibility in determining routes. Priorities are generally set out for them; however, in the event of truck breakdowns, they reprioritize tasks, co‑ordinating with other drivers and possibly making arrangements to transfer loads to other vehicles. · remember routes to loading docks in many cities. · remember phone numbers of often called contact persons at various destinations. · remember rules and regulations for the transportation of dangerous goods. · remember which routes have low underpasses which could pose a problem for the truck. 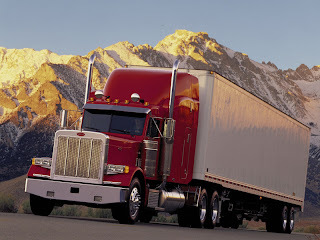 Truck drivers generally drive alone, although sometimes they drive with a partner or helper who assists with unloading. They may work as members of a team when loading and unloading large cargoes. Participate in formal discussions about work processes or product improvement. Have opportunities to make suggestions on improving work processes. Monitor the work performance of others. Inform other workers or demonstrate to them how tasks are performed. Truck drivers continue to learn through their participation in a number of courses, such as Transportation of Dangerous Goods (TDG), Air Brakes Class 1, defensive driving and forklift training. They may also attend information sessions to learn about safety regulations and new machinery and trucks purchased by the company. As part of regular work activity. Through training offered in the workplace. Through off‑site training: during working hours at no cost to the worker. In addition to collecting information for this Essential Skills Profile, our interviews with job incumbents also asked about the following topics. The truck drivers interviewed mentioned these physical aspects of their jobs. Truck divers sit most of the time. They also stand and walk at the beginning and end of the route when assisting in the loading and unloading of vehicles or supervising these functions. They may stoop and bend to unload and load items. They climb into high cabs and may have to climb onto the roof of the truck or crawl underneath the vehicle to perform maintenance checks. Truck drivers use upper and lower limb co‑ordination to drive trucks. Truck drivers may lift fuel hoses weighing 50 pounds. They may lift boxes and containers weighing up to 100 pounds. Dollies and forklifts are used to lift items of greater weight. Good peripheral vision is helpful when driving a truck. The truck drivers interviewed felt that truck drivers should be patient, alert, organized and able to handle the stress of heavy traffic and tight deadlines. They should have a positive attitude and the ability to work alone for considerable periods of time. The trend toward a higher level of log book enforcement means that truck drivers need to be able to fill in complex documentation accurately. Some drivers may need to upgrade their document use skills to meet the more stringent requirements. With the growing use of computerized satellite systems in trucks, their drivers will need to be computer literate.